Kalanchoe needs to be cared for in a very particular way for the absolute best possible results. 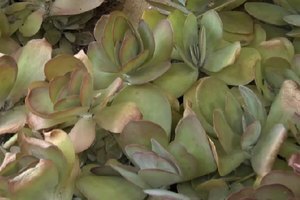 Learn about gardening care for Kalanchoe with help from an experienced professional gardener in this free video clip. Hi, this is Nell Foster with Joyous Garden, and today I'm going to tell you how to care for a kalanchoe. Some people say kalanchoe but in the horticultural world, the botanical world the ch is pronounced k so I'm saying kalanchoe. You might know it as kalanchoe. And I'm going to talk a bit about my kalanchoes outdoors too because I live in Santa Barbara. We are here in my front yard, welcome to my front yard. It is the end of January and these are kalanchoe therisofolias which were hit a little bit by a four day rainy spell we had and then it was very cold so they're looking a little sad now. So for their care, there really isn't that much I run the drip for 12 minutes one a week. They're planted in a sandy loam soil. I compost them about every few years but otherwise all I really do is I take off the leaves that don't look good on them and I just did a video on propagating kalanchoes and I said I'm going to have to cut a lot of these back because they're getting a little bit older too and it's going to let the new plants that are inside grow through. But these are the kalanchoes that a lot of people are familiar with. It's kalanchoe blosco leona. It's the common kalanchoe that is sold as a house plant. It's sold in big box stores it's sold at the grocery store I've seen it. I got this one at our farmer's market. I'm lucky to live somewhere where there's a year round farmer's market and they sell plants. And this one is sold mainly for its flowers. I was an interior scaper and we used this in buildings a lot because the flowers are long lasting and also because it is a succulent and can take the dry air. And that's something that you remember. It is a succulent, these leaves are very moist, they're very filled with water as are the stems and you do not want to over water it. You want to make sure that it's dried out in between the waterings otherwise it will really mush out and turn brown and the leaves could also fall off green too if you're giving it too much water. And it likes bright light, good light. You don't want it in a direct hot burning window because it will scorch the leaves but you want to give it good light. If it was in a south or west facing window you'd want it a little bit away from the window so it could get that good light. And in regards to fertilizer, if you need to just give it something like this is seaweed extract it's a nice organic liquid kelp fertilizer. You could give it a balanced organic liquid fertilizer would be something like 12 12 12 moo poo tea here is also good for succulents because it's just a soil conditioner. And that's about all you do to it. In order to get it a flower again, it takes awhile for it to flower again so you might want to do something like take a cutting of it and that you'll probably get a flower sooner off of this than you will off of this or you might just want to buy a plant if you want to keep the flowers coming on because it's something that's not going to flower on a regular basis like bang, bang, bang, bang every month. This one will probably give you good color for at least two months though. They are great house plants and very easy to care for. This is Nell Foster with Joyous Garden and I have just shown you and told you how to care for a kalanchoe.